220-09-02: "A supposed tetraploid form of R. rugosa" X Basye's Blueberry. The seed parent is a rose shared with me by Joan Monteith about a decade ago. Joan did an experiment in which she treated a select form of R. rugosa with the chemical Colchicine with the hopes of doubling the plant's gene count from 2X to 4X, making it more compatible with most modern tetraploid hybrids. It has not been determined with any certainty that this Rugosa is in fact a Colchicine-induced tetraploid; measurements of pollen diameter has been inconclusive. However, I have pursued breeding concepts that presume it a tetraploid and I will simply evaluate the results as I proceed. The flower is small, at just under 2", quite heavily Clove-scented, thick of petal and most remarkably, each petal has a strong white streak down the middle. Don't ask me where this trait came from. 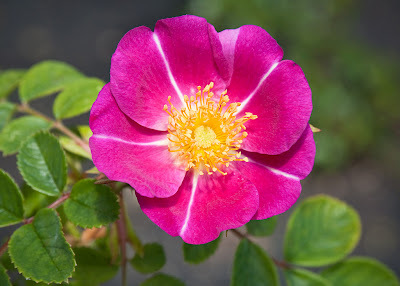 I do know that Ralph Moore once showed me a Rugosa hybrid with about 15 petals that showed the same petal streak, and it was striking. Pollen has been gathered from this seedling and will be placed on a number of tetraploid seed parents I have assigned for the purpose of testing pollen fertility. In the meantime, I look forward to evaluating this plant for sturdiness and disease resistance. I am hopeful, given its pedigree, that Blackspot resistance might be superb. Stripes that present in a consistent symmetrical pattern as you show in this seedling (as opposed to random striping) is very interesting!